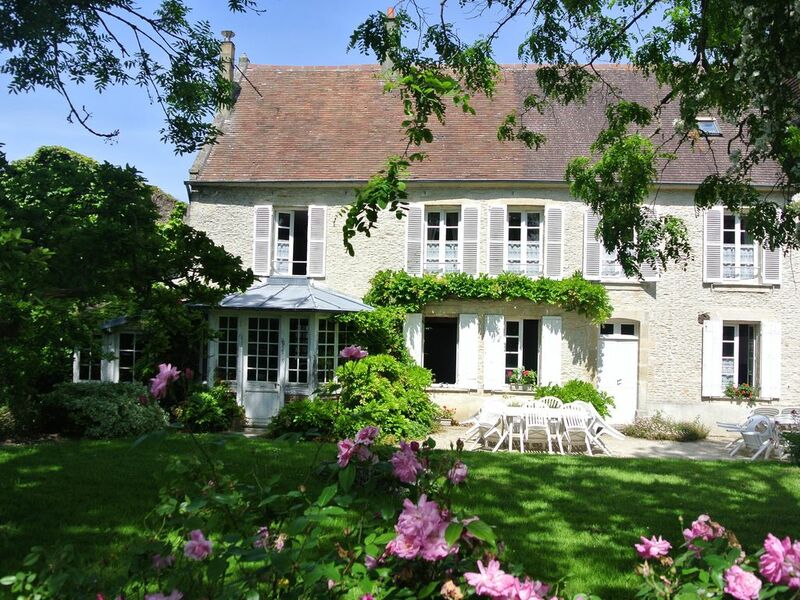 Large cottage for 6 to 8 people on 120 m² in a house of the 18th century. The rooms are spacious with a beautiful view of the garden. - 3 bedrooms: 1 with a double bed, 2 with 2 single beds that can be pushed together. A baby cot and a high chair can be provided for young children. - Kitchen: microwave, refrigerator, stove, oven, dishwasher, washing machine. - living room with fireplace. A sofa bed in the living room can sleep 2 additional people. - A bathroom upstairs and a shower on the ground floor accessible for disabled. The house is enhanced by a beautiful garden with trees and flowers, decorated with a closed basin (secured by a gate closing). To enjoy, lounge chairs, a table and garden chairs are at your disposal. A large playground is accessible, as well as a portico for children. The owner lives in a terraced house overlooking the same garden. She speaks French and German. You can park your vehicles in the yard, right next to the house. The access gate to the property is motorized: you will have a remote control to open it and close it without getting out of the car. You can also come from the Caen train station by taking the bus line 46 (Caen> Douvres-la-Délivrande) and going down to the "Pieplu" stop at Colleville Montgomery. This is a family home for generations. The house is very large, we split into two to allow my grandmother to live on one side and propose a lodging independent of the other. The bathroom (bath) is on the 1st floor. An extra shower is available on the ground floor, in the laundry room: it is convenient to rinse off after a day at the beach or for people who have difficulty climbing stairs. This property is very spacious, with more than enough room for our family of 5 which included a lively 9 year old. Lots of parking and a very large garden. There are high walls round the property and a remote controlled gate which provide seclusion and security for small children. However, there are areas of the property which appear to be rented out to businesses and the odd van turned up occasionally which parents of small children should be aware of. The decor was in keeping with the age of the property, which some other have seen as a minus point. We liked it but, like another reviewer, we all thought that the bathroom is badly in need of replacement. The size of the bath is similar to others we have come across in some hotels in the area so did not come as a surprise The only one who could fit in it properly was the 9 year old. I would either replace it with a bigger one or a modern shower. None of us were brave enough to use the shower in the laundry area due to the lack of privacy. But we are British(!). Having separate toilets up and downstairs is a plus. The property is old with flagged floors on the ground floor and traditional shutters on all the windows which keep the place cool in hot weather. The kitchen is well equipped and there is a barbecue if you want to use it. We ate or had a drink at the table in the garden lots of days/evenings. The property is only a 2 minute walk to the deli and pharmacy should you need anything and the tabac and boulangerie is only a 5 minute walk. We used Carrefour 10 minutes away in Ouistreham for food shopping as the local supermarket burnt down a few months ago but there are plenty of restaurants nearby (Ferme St Hubert is excellent) in Colleville- Montgomery and Ouistreham to eat out. Nous avons loué cette maison pour un week end familial,bien placée pour découvrir les plages du débarquement.Très bel extérieur avec jardin,a savoir quand même que vous n'êtes pas vraiment seuls,puisque les propriétaires sont susceptibles d'être dans la maison accolée,sans aucune séparation sur la terrasse...De plus l'intérieur de la maison est vraiment dans son ''jus'',il y aurait vraiment besoin d'un gros gros rafraichissement ! pas de salle de bain,juste une mini salle d'eau très limite...de plus il faut forcément passé dans une chambre pour y accéder!ménage également limite...Pour toutes ces raisons,et pour avoir souvent réservé des maisons pour un week end ,nous trouvons que le prix est excessif! J’ai pris note de vos remarques. Toutefois, je trouve votre commentaire un peu dur : vous sembliez heureux de votre séjour à votre départ et ne m'aviez pas fait ce retour. Le prix était plus que raisonnable pour héberger 8 personnes pendant 4 jours, surtout lorsque le linge de maison est fourni (envoyer les draps de 8 lits au pressing est coûteux). Je tiens aussi à préciser que le rez-de-chaussée a été repeint en 2016. La salle de bain est effectivement accessible depuis les chambres : un plan de la maison est disponible dans les photos et je vous avais prévenu qu'à 8 personnes vous risquiez d'être un peu serrés. Ravis de notre séjour dans votre agréable gîte. Bien fourni par le propriétaire, le gîte est sympathique, avec de beau jardin .Les mirabelles et les pommes du jardin sont délicieux. Les chambres de la maison sont vitrées et BEIN ensoleillées. Le salon , la salle à manger et la cuisine sont larges. Il y a tout ce qu'il faut pour nous. La plage et le supermarché sont à 3 minutes de voiture. Aussi le tabac, la pharmacie, le cabinet médical et la boulangerie sont à côté du gîte. Merci pour votre commentaire. À très bientôt en Normandie ! Le gîte est très agréable. Colleville-Montgomery is located on the coast of Nacre 3km from Ouistreham and 12 km from Caen. The sea is within 3 km. The town has kept an authentic character to this range. You can also take a walk in the swamp of Colleville, closer to nature. Supermarket 2.5 km, and many nearby shops: butcher, pharmacy, bakery ... You will seek croissants walk for your breakfast! Many historical sites and museums await you, including the famous Pegasus Bridge and the Caen Memorial. You will be at the heart of the landing beaches. Fishing for bass Surf Casting and sea are possible and pick up shells and shellfish at low tide. Sailing, Windsurfing and yachting are easily practiced for the beach. Many equestrian clubs offer horseback riding or pony. A Ouistreham, Luc St Aubin on sea or sea, you can try your luck at the casino. The amusement park Festyland is twenty minutes from the cottage.